Native to South America, Yuca is a bittersweet root vegetable with delicate flavor that frequently replaces potatoes for something a little different. Native to South America, yuca (also known as cassava) is traditionally served with an onion, garlic and citrus flavored sauce known as Mojo. While this woody root vegetable is used by many cultures for its medicinal properties, it also is a powerful gluten-free carbohydrate that provides fuel for high energy. Peel and halve the yuca roots. 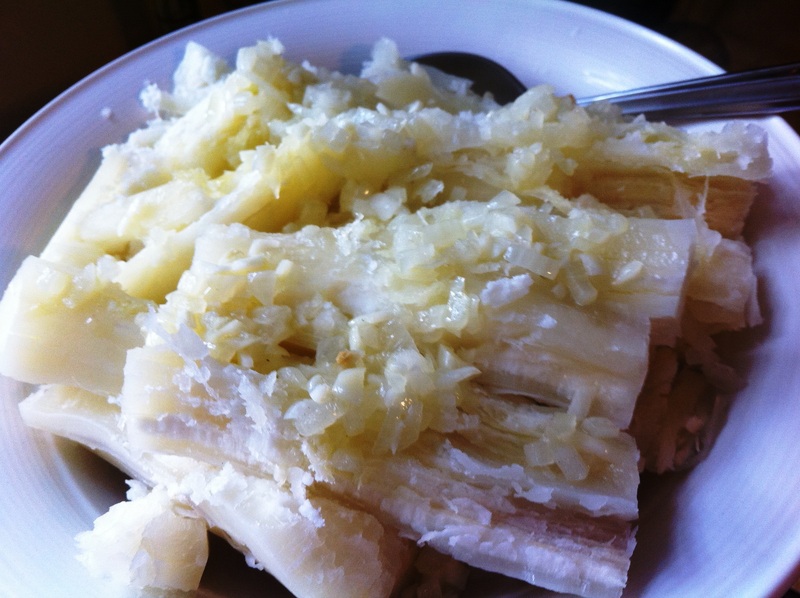 Place yuca in a large pot with 1 teaspoon salt and cover with water. Bring to a boil and cook for 20 minutes or until just tender. Do not overcook or it will get mushy and slimy. When cooked, let sit in the warm water until ready to serve. Meanwhile, make Mojo sauce. Heat a small skillet over medium heat and add the olive oil. Add garlic, onion and remaining teaspoon salt and cook until onion is softened, about 2 minutes. Turn off heat and whisk in the juice of one lemon. Drain yucca and transfer to serving dish. Drizzle Mojo over top and serve warm. I discovered this vegetable on a trip to Cuba and promptly sought it out at my local farmers’ market when I came home. I have been trying to find new ways of enjoying it and this sounds perfect! Thank you so much!